At Earl Stewart Toyota, customer service and satisfaction is our number one priority. This is why our team operates under the Earl Stewart Code every single day to provide customers with all they need, whether that be a new, used, or certified used Toyota, regular maintenance, repairs, or automotive advice. Check out some of the ways Earl Stewart Toyota of North Palm Beach has been recognized and awarded over the years, then take a look at car dealership reviews left by some of our customers in the Palm Beach County and West Palm Beach areas! 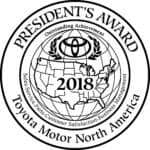 The Toyota President’s Award is given to Toyota dealerships in the U.S. that have demonstrated a commitment to maintaining Toyota’s high standards for customer satisfaction, with judgement categories including Customer Sales Satisfaction and Customer Service Satisfaction. Earl Stewart Toyota has received this award fourteen years in a row. In 2012, Earl Stewart Toyota received the President’s Cabinet Award for the fifth year in a row. This prestigious award is only awarded to 12 dealerships nationwide out of over 1,200 operating in the U.S. The dealerships that earn this award are recognized for operational superiority, high-volume sales, and outstanding customer satisfaction performance. The Board of Governors is a group of hand-selected individuals recognized for their sales success and customer dedication. To be eligible for the Board of Governors you must be employed at one of the top 60 dealers in non-fleet vehicle sales volume, amongst many other requirements. 2012 was the fifth consecutive year that representatives from Earl Stewart Toyota were on the Board of Governors. Earl Stewart Toyota continues to be dedicated to delivering a stellar customer experience. Our staff is happy to answer any questions you may have about new vehicles, maintenance, or Toyota features like Toyota Entune and Toyota Safety Sense 2.0. Contact us today to schedule a test drive near Palm Beach Gardens!